Beijing (Dec. 12)—Incoming Chinese Commerce Minister Chen Deming joined U.S. Commerce Secretary Carlos M. Gutierrez, EPA Administrator Stephen Johnson, Treasury Secretary Henry Paulson, U.S. 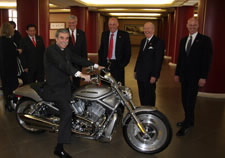 Ambassador to China Clark T. Randt and Chairman of the Export-Import Bank James Lambright in trying out a Harley-Davidson motorcycle during a break in meetings of the Strategic Economic Dialogue. The United States is seeking to expand access for U.S.-made motorcycles into the Chinese market. Gutierrez Signs U.S.-China Tourism Agreement to Boost Visits to U.S.